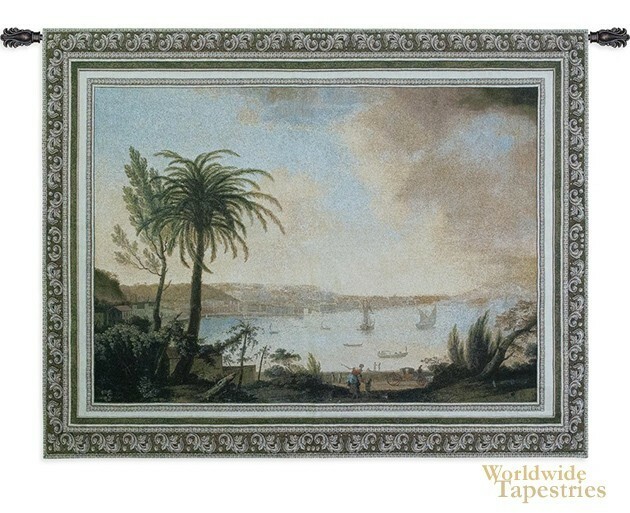 A wonderfully evocative work, this "View of Naples" tapestry shows the work of Pietro Fabris (1740-1792). Thought to have been born in England, and Venice trained, this artist produced works celebrating the countryside of famous places including Pompeii and the eruption of Vesuvius. Here we see the beautiful coast of Naples, the capital of Campania, and is the third largest city in Italy. Naples witnessed the destruction of Pompeii as it is close to Vesuvius and has had art depicting the beautiful city with the volcanic eruption in the background over the sea. Here we see a gorgeous afternoon light, where the golden sun is casting shadows and yellow tones on the clouds. The palms and flora casts a beautiful silhouette to reflect the warm climate of this region. This cityscape tapestry "View of Naples" is backed with a lining and has a tunnel for ease of hanging. Note: Tapestry rods and tassels, where pictured, are not included in the price.